BERKELEY, CA  A chemical profiling technique that has potential for detecting the onset of cancer at the cellular level has been developed by scientists with the Lawrence Berkeley National Laboratory (Berkeley Lab) and the University of California at Berkeley. 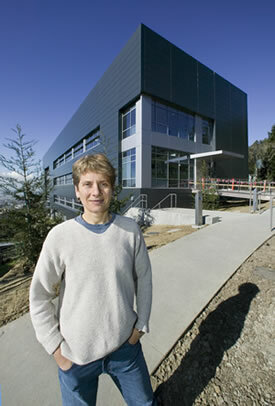 Carolyn Bertozzi was recently named Director of Berkeley Lab's Molecular Foundry. She is a chemist with Berkeley Lab's Materials Sciences and Physical Biosciences Divisions, a UC Berkeley professor, and an investigator with the Howard Hughes Medical Institute. In a paper published in the Proceedings of the National Academy of Sciences (PNAS) that is now on-line, a team of researchers, led by chemist Carolyn Bertozzi, has reported a technique for rapidly profiling O-linked glycoproteins in living animals. Changes in O-linked protein glycosylation – the attachment of sugars to proteins through an oxygen atom on the protein – are known to correlate with cancers and other diseases, such as inflammations and bacterial infections. Until now, however, scientists have lacked a practical means of monitoring such changes in a physiological setting. "With our profiling technique, we can take pictures over time of the sugars that coat a cell's surface or are released by the cell into the bloodstream and monitor any changes that occur," said Bertozzi. "We can then compare the sugars produced by cells that become cancerous with the sugars from normal cells. Ultimately, the idea would be to use this information to create a simple blood test that would diagnose a patient for cancer." Bertozzi is the Director of Berkeley Lab's Molecular Foundry, a faculty scientist with Berkeley Lab's Materials Sciences and Physical Biosciences Divisions, the T.Z. and Irmgard Chu Distinguished Professor of Chemistry and professor of Molecular and Cell Biology at UC Berkeley. She is also an investigator with the Howard Hughes Medical Institute (HHMI). Co-authoring the PNAS paper with her were Danielle Dube, Jennifer Prescher and Chi Quang, who were all members of her research group when this work was done. The key to successful cancer treatment is detection at an early stage of development – the sooner the better. While detecting an over-abundance of an antigen has been used to create an effective blood test for prostate cancer, it is believed that even more effective blood tests for a large number of epithelial cancers, also known as carcinomas, could be realized if a practical means of detecting the sugars attached to blood-borne proteins were available. Most proteins are modified post-translationally (i.e., after a protein's polypeptide chain has been formed), and one of the most common of these events is glycosylation, which can be either oxygen or nitrogen-linked. Glycoproteins are ubiquitous on the surfaces of most cells and help a cell communicate with its neighbors. "Studies of cells in culture have suggested that monitoring changes in O-linked glycoproteins would be an effective biomarker for cancer, but for the past three decades if you wanted to know which glycans were present on a cell, you had to isolate the surface proteins one at a time," said Bertozzi. "Our profiling technique lets you quickly scan all the proteins at once. Once we attach our tags and probes, the proteins either light up due to the presence of sugars or they don't." The profiling technique developed by Bertozzi and her team starts by tagging certain glycoproteins with a metabolic label called N-azidoacetylgalactosamine (GalNAz). An over-secretion of the labeled glycoproteins, which form the lubricant that protects the surfaces of cells, is known to increase the potential of cancer to spread. Profiling mucin-type O-linked glycoproteins by metabolic labeling with an azido GalNAc analog (Ac4GalNAz) followed by Staudinger ligation with a phosphine probe (Phos-FLAG). R and R' are oligosaccharide elaborations from the core GalNAc residue. GalNAz has an azide group, which can be chemically tagged with probes that can be visualized. The probes react with the azide by virtue of a phosphine group, a process developed in Bertozzi's laboratory called the Staudinger ligation, named for the German synthetic-organic chemist and Nobel laureate Hermann Staudinger, who first described the reaction between azides and a phosphines almost 100 years ago. including liver, kidney, and heart, and also in serum and on isolated splenocytes," Bertozzi and her co-authors state in their PNAS paper. "B cell glycoproteins were robustly labeled with GalNAz but T cell glycoproteins were not, suggesting fundamental differences in glycosylation machinery or metabolism. "Furthermore, GalNAz-labeled B cells could be selectively targeted with a phosphine probe by Staudinger ligation within the living animal. Metabolic labeling with GalNAz followed by Staudinger ligation provides a means for proteomic analysis of posttranslational modifications and for identifying O-linked glycoprotein fingerprints associated with disease."